Many people wonder why good design and implementation of corporate LAN and Edge features is necessary. There are many answers to this simple question and among them, we require a good network to be least vulnerable to unwanted intrusions along with it to be able to support all our requirements. We have compiled a list which you can check to know how you can mitigate many risks by using out of the box features that are often supported at no extra license cost and in which cases you should use these features. One broadcast domain for whole network or only user network can lead to unnecessary broadcast traffic, which upon a traffic loop might cause complete service outage. Secondly, but even more important, large broadcast domains are vulnerable to traffic sniffing and easier man in the middle kind of attacks. Lastly, lack of VLANs can cause an administration mess. 2. Anti-Loop Mechanisms; Delays, drops, annoyance and more. When switching loops in the network arise the troubleshooting game begins as services and systems start showing delays, browsers stop responding eventually leading to user complaints and increased pressure on IT departement. When we add broadcast affect on top of this the network can go completely out of order. A human error by an IT admin plugging the cable in wrong port can cause the loop formation. Lack of Spanning Tree in operation is additional risk that leads to loop effect. Even if the network is working well, one could be a victim of virtualization administrator making a mistake. 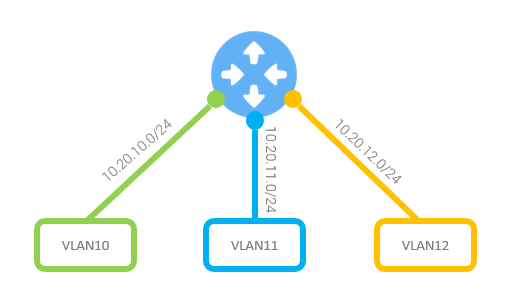 An example could be mistake with interface bundling on the vSwitch. This can cause switching loops as well. I know one large outage of large e-commerce that was caused by loop on virtual machines level (that was “test & dev” environment 😉 hitting production). Another risk is when network is physically redundant and switch port stops receiving BDPU frames then it transitions to forwarding state causing loop. As an example the lack of BPDU could be caused by unidirectional link failure. Features like Loop Guard could avoid the loop formations by taking additional check and putting port in STP loop-inconsistent state when loop condition is in place. Loop inconsistent state behaves like STP blocking state. 3. ARP Inspection. Are your sure your data is not intercepted? ARP is something that is still not understood by all as it should be. 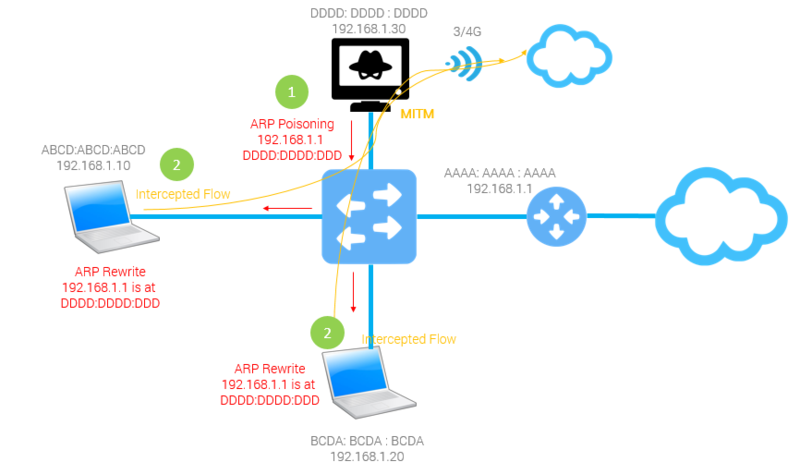 As I wrote here: ARP – what is it for ? this is fundamental requirement to understand for every network specialist and to better understand the problem, please read the post first. Because of ARP’s broadcast behavior it can be used to violate user confidentiality by making man in the middle attack. Malicious user (or hacker) working in Ethernet segment can use a few techniques to poison the ARP table of other device’s in the same segment so that they start thinking that the malicious computer will be the trusted gateway. When they start sending traffic to malicious MAC address (instead of real gateway MAC address), hacker can intercept the session and listen to real traffic. As an example, an attack can be performed by sending gratuitous ARP message to whole broadcast segment. One of preventive methods is to use ARP inspection technique implemented on ethernet switch port level. Thanks to this, switch controls all the ARP messages that are coming into the switch ports and compares the MAC and IP pairs against the table learned from DHCP Snooping process. If switch sees the wrong MAC and IP on the switch ports, it puts the port into the down state. DHCP is widely used protocol for obtaining IP addressing in dynamic way in Ethernet networks. 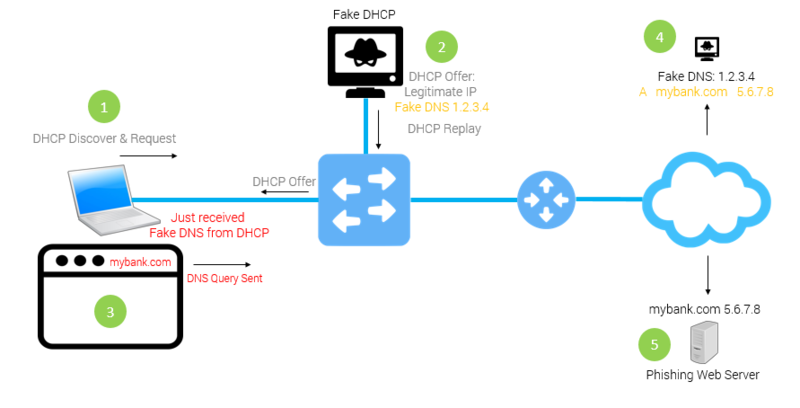 Because it benefits from broadcast behavior, similar to ARP, DHCP is vulnerable to layer 2 spoofing attacks that make use of presence in common broadcast segment. Such attacks can lead to the phishing of sensitive information . The problem described above is very serious having a high probability. I can bet that there is no protection against DHCP attacks in 90% of enterprise networks. This is something I recall from my experience. Prevention against such problem could be easy because I think almost all key LAN solution vendors have mechanism like DHCP Snooping that can be enabled with no extra fee. How does it work? IT admin configures switch ports dividing ethernet ports to trusted (DHCP server messages are allowed on this port ingress) and untrusted (DHCP Server messages are not allowed on this port ingress). When there is a violation seen on port – for example DHCP Offer message incoming on Untrusted port, the switch disables the port arbitrary. In parallel, ethernet switch with such prevention technique enabled learns legitimate DHCP conversations between clients and servers and stores IP – MAC – Switch Port information in DHCP binding table for further reference. Very often other mechanisms like ARP inspection or IP Source Guard make use of DHCP binding table. Sometimes, especially during Proof of Concept (PoC) projects or infrastructure audits, network admins start seeing suspected traffic coming from their internal network that is sourced from IP ranges not in corporate scope. This may be the sign of malicious activity like IP spoofing or misconfigured devices that are forgotten by IT stuff. With IP spoofing issues there are two general problems associated. Junk traffic generation that may cause additional utilization of network resources and one needs to stop such traffic. IP spoofing activity meaning someone generates traffic from inside of corporate network with bad sources. 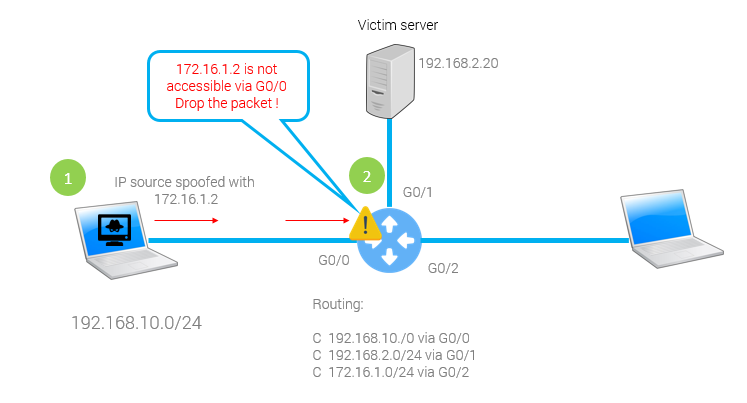 The behavior of most routing devices is to route traffic based on destination IP in packet header so the spoofed traffic can be freely forwarded. The bad thing about this is that spoofing can be used to attack other systems in order to hide the real attackers. An example could be DoS attack with high volume of TCP SYN segments directed to critical server farm with dynamically changing sources. If the source IP will point to subnets or Internet destinations other than attacker is located in, attacker can quickly allocate server resources causing service outage in the same time being invisible or at least difficult to track back. To prevent spoofing once can use Reverse Path Forwarding that works simply by verifying source IP address of incoming packet against routing table. If layer 3 device sees the route in routing table that would be used to forward traffic to verified source IP address, the packet is allowed if not router drops the packet. Part 2 of features checklist is in progress. If you want to read more Stay connected!